Schools and government agencies will tell you that with education – the earlier the better. Does research really show that early education is beneficial? Many states institute mandatory school attendance by age six, with exemptions for private schools and homeschoolers. For some children, that means they don’t actually have to engage in any structured education until that age. However, preschools are offered for as little as age two years old, starting the institutionalized education four years earlier than needed. But is That Still Too Young? What Does the Research Say? Research is clear that children who start schooling later do better, including SAT scores, college entry, and even a lower incidence of juvenile crime. Indeed, this study showed that August entry children in a grade were more likely to engage in crime than September entries. How much more is this true for children who wait to start formal education one, two, or even three years? A lot. This Stanford study showed that children who were held back one year for kindergarten entry were 73% more likely to not have attention issues during school. Play-based learning for young students proves to actually teach them more, according to The Playful Brain: Venturing to the limits of neuroscience. Playing, rather than listening, to a lecture or doing a worksheet actually creates more neuron connections in the brain. All children, especially young children, should get to utilize this advantage. Another study demonstrated that children who attended young play-based education rather than regular were still excelling beyond their peers after their sixth year of traditional schooling. This extremely important study showed that children who were taught to read at age 7 were academically no different than children who had been taught to read at age 5, though the children taught to read later were more positive about reading and had better reading comprehension. I could list 100 more studies, but the research is clear. Earlier education is not better. Why is Preschool a Thing? The truth is that most early education laws were introduced to put more women in the workplace. This is great for the national economy, but not great for the home economy. After taxes, school fees and expenses, gas, fast food, the family is usually left in a financial [and emotional] deficit. Women are stressed, leaving the family stressed, and children enjoy little time with parents. Less meals are made at home, increasing food expenses and health bills. This isn’t helping anyone in the family. If we are honest, most young preschools are glorified daycares. If you are a stay at home parent or could be, you can easily provide the same amount of education, but even more free play, relaxation, and fun. Preschool was not created to educate little ones better. Homeschooling is easier than you may think, and today it’s a great alternative to public or even private schooling. Be sure to educate yourself on the homeschool laws in your state. Most regions have a number of homeschool coops – groups of homeschoolers where classes of many types are offered by the parents. There are also groups that put together classes at local libraries, parks, and field trips. Homeschooling curriculum is available in every possible type that you want, and some institutions have online classes available. Homeschooling ensures that your children learn at their own pace and can focus on their interests all in the loving environment of home. 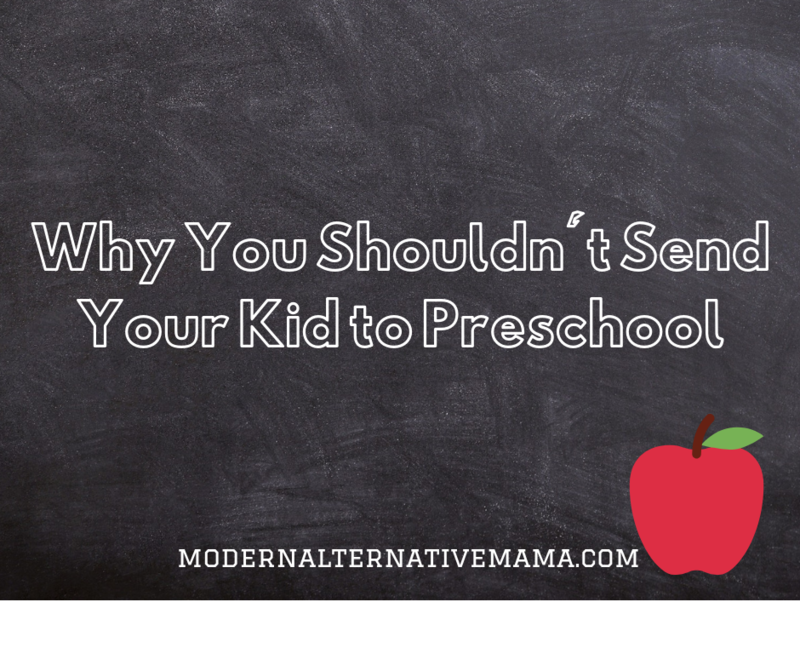 Even if you plan on homeschooling, it is not necessary to start sit-down academics with your preschooler. Remember, preschoolers learn best through play! How Should You Avoid Preschool? Plan to stay home, join some local homeschoolers (even if you won’t homeschool), and use play-based education ideas (alllll over Pinterest). If you plan to enroll your child in school, hold your child back the first year of kindergarten. Sometimes the best educator is an older child. If you don’t have older children, find a family to buddy up with and invite the children over to play often. 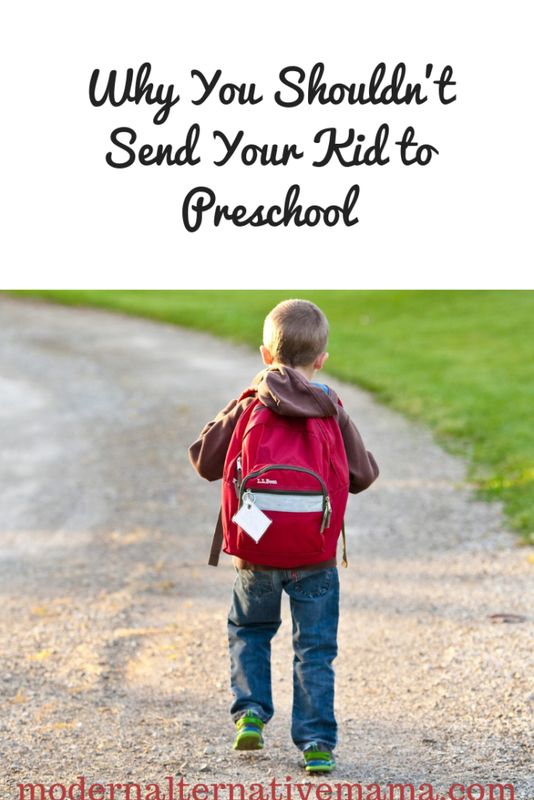 Do not fall into the pressure to enroll your children in preschool. Research shows preschool does not help, and even harms, children academically. There are many alternatives to education that every parent should look into to give their child the best education possible. When did you start schooling your children? How did it go? I hate to be the spoilsport in the conversation, however, there have been enough studies and research done throughout recent times to indicate that children learn differently at different ages. Different styles of learning, different kiddo’s…imagine that. What the real reason the push is on for earlier and earlier pre-school goes beyond the glorified baby sitter situation and right into the hands of the Federal Government, and the almighty dollar. Cradle-to-grave tracking of our children, their habits, learning styles, where they failed tests, what their behavior is like within the social structure of the classroom and the school system…if you think that I am not telling you the truth, there are hundreds of books, documents, video’s that are out available to you to understand just exactly what the schools are all about…and it isn’t education.